Jerzy Skolimowski was part of a group of young filmmakers who emerged during the period of “small stabilisation” in Poland, an era of tightened political control and censorship, conformity, and petty bureaucracy, which lasted throughout the 1960s (1). Like his contemporary, Roman Polanski, Skolimowski largely abandoned the obsessive focus on national history and heroism conducted by the “Polish School” of filmmaking, in favour of ironic reflections on the moral dilemmas of everyday life. While the exceptional protagonists featured in the “Polish School” films were shaped by their experiences of the war, it was the conformist “stability”, characterised by “the fear that everything has already been thought of and done […] of melting into the masses”, which is essential to understanding the psychology of Skolimowski’s characters (2). Skolimowski’s second feature, Walkower/Walkover, in many ways follows on from his diploma film, Rysopis/Identification Marks: None (1964), in which engineering student Andrzej Leszczyc (Jerzy Skolimowski) is preparing to begin military service. In Walkover, Andrzej has left the army, and appears to drift around the country participating in boxing fights. In an industrial town, he runs into Teresa (Aleksandra Zawieruszanka), a government engineer, who has arrived to implement a new project at a factory. Andrzej wins in a local boxing match, but decides to leave with Teresa instead of facing a much stronger opponent the next day. In a stunning long take shot from a moving train, Andrzej’s previous opponent follows him on a motorbike and goads him for his cowardice in forfeiting the fight. Andrzej subsequently jumps from the train and returns to the ring. His opponent, however, fails to turn up, and Andrzej wins in a “walkover”. As Mazierska has pointed out, the “autobiographical effect” of Walkover is particularly striking. 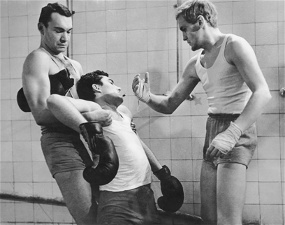 Skolimowski, a boxer and poet as well as a filmmaker, plays Andrzej, and his poetry is recited in voiceover in several scenes (3). The film was part of a movement towards a more personal cinema which focused on the individual rather than society; the film’s narrative concomitantly replaces dramatic incidents linked through cause and effect with a structure of loosely joined episodes following Andrzej’s movements over two days, with the camera almost never leaving him outside the frame except to show what he sees (4). The opening of the film is a good example of this refusal to engage in conventional plot development. The film’s first image is a close-up of a woman’s face which disappears from the screen when she jumps under the train that Andrzej and Teresa are on (5). Rather than moving towards this possible epicentre of a dramatic narrative, however, the camera remains with Andrzej as he talks to Teresa, while people file past them towards the scene of the suicide. The “masses”, and the unexplored dramatic possibility, are literally bypassed by Andrzej and Teresa as they press through the crowd. I don’t know what I am here for. After so many years or after something like youth or love […] with my hand on my neck, I want to fix everything […] but only fix my tie. And when it is too late for everything, it is still not too late for insuring your life at the State Insurance Company. The poetry is recited over close-ups of Andrzej’s face looking straight into the camera, as though the voice expresses, from a non-diegetic time and space, something that it is impossible to verbalise in Andrzej’s current environment, due not necessarily to censorship, but to the moral crippling of society. It is significant, in this respect, that the woman’s suicide is set against Andrzej and Teresa’s banal conversation about employment and “very important” positions, as though linking the impossibility of her continuing her life with these stultifying conditions of the regime. In this sterile atmosphere, the film seems to suggest, it is important not to give up and be “walked over”. Both Andrzej and Teresa encounter much more powerful rivals that they must attempt to overcome. When speaking to Teresa about her project, the Director of the factory uses terminology suggestive of one of Andrzej’s fights: the other team “is placing forward their strongest competitor”; the Director will provide the “playing field” but “it’s going to be a big match fighting the project office”. Indeed, Teresa loses her battle and gives up, prompting Andrzej to reveal part of his motivation in his investment in boxing: when you have no plans, no projects, he says in a recording, you may as well fight for anything at all, as hard as possible. Despite Andrzej’s return to the fight, the film’s ending is highly ambivalent. Haltof argues that Andrzej’s decision not to give up on the boxing match “signals that he wants to embrace a mature life, which requires fight and commitment” (9). For Ford and Hammond, this constitutes “a magnificent lesson of courage and endurance” (10). Above all, however, it is a return to a repetitive and fruitless cycle of fighting and winning watches and radios to be sold in the next town. He neither succumbs to a “walkover” nor to the conformity that marrying Teresa might suggest, but remains in a state of suspension. As Eberhardt has argued, this state often characterises the heroes of Skolimowski’s films, who are people “with a suitcase in their hands”, going somewhere or coming back from somewhere, extracted from the “normally functioning order of the day”, without yet submitting to the “regulations of the journey” (11). This liminal state is also reflected in the way much of the action is played-out in what Hodsdon has called “simulated performance spaces”, such as the boxing ring and the factory floor where Teresa argues her case, watched through a window by Andrzej (12). In such spaces, the encounters between people seem less “authentic” and meaningful than non-efficacious rituals. The end of the film demonstrates this more clearly. Despite not entering the ring, Andrzej’s opponent is waiting for him outside of the factory. When he accuses Andrzej of being scared of fighting him, Andrzej “fights back” and hits him, getting a blow to the head in return that sends him stumbling to the ground. In the final panning of the camera to a blank white surface, three horizontal bars of a fence precisely echo the ropes of the boxing ring, embedding the characters once again in a simulated performative space, as though this final act of “fighting back” has as much meaning as if it had taken place within an artificially engineered competition. Such rich visual associations that recur throughout the film arise, according to Skolimowski, from his poetry. “My mind”, he stated, “is trained along the path of poetic associations – I’m not afraid to wander away from direct narrative” (13). Much of the film carries thematic resonances concerned with the realities of industrial and political expansion without pressing them into the service of the narrative: an old man who wanders the factory grounds with a goat; the large cross which a man is seen momentarily scaling with his back to the spectators, like a backwards crucifixion, before being dismantled by a crane; the “miracle” of making a chicken lie still by placing a stick on its neck, echoing the act of succumbing to conformity expressed in the poem cited above. While The New York Times critic Bosley Crowther criticised Walkover as “distractingly random and incoherent” (14), Michel Ciment, more sympathetic to Skolimowski’s love of jazz, argues that his films are made “in a manner very much like a jazz musician – all rhythm and improvisation” (15). The film’s use of cinematographic disjunctions, which are traditionally seen to encourage a critical awareness rather than a facile consumption of a narrative, is reminiscent of much European New Wave cinema. The crossing of the 180 degree line, the confusion between diegetic and non-diegetic sound created through Andrzej’s radio, and the setting of characters against abstract surfaces, is reminiscent of Godard, although Skolimowski has claimed that he had not seen any Godard films at the time of making his two first features. The long shots used to show Andrzej and Teresa, emphasising their disconnection from each other and alienation in industrial outskirts, recall Antonioni. According to Skolimowski, to see the film is to “open one’s eyes wider” to, presumably, not only the moral problems of contemporary Polish society, but also to the possibilities created through cinematic form for a filmmaker willing to “fight back” against artistic conformity (16). The term “Third Polish Cinema” was coined by critics at the time to differentiate this generation of filmmakers. As Marek Haltof has pointed out, however, the term has little explanatory value, attempting as it does to cover diverse themes and styles of filmmaking. Haltof, Polish National Cinema, Berghahn Books, New York, 2002, p. 125. Konrad Eberhardt quoted in the booklet for the DVD box-set Jerzy Skolimowski, Wydawnictwo Telewizja Kino Polska, Warszawa, 2008, p. 6. Ewa Mazierska, “From Participant to Observer: Autobiographic Discourse in the Films of Jerzy Skolimowski”, Kinema Fall 2008, p. 46. The woman is played by Elzbieta Czyzewska, who played Andrzej’s partner in Identification Marks: None, and who was Skolimowski’s partner in real life. By the time of Walkover, their relationship was breaking up, and her character is only briefly present at the beginning before immediately committing suicide. Charles Ford and Robert Hammond, Polish Film: A Twentieth Century History, McFarland, Jefferson, 2005, p. 144. Bruce Hodsdon, “Jerzy Skolimowski”, Great Directors Database: Senses of Cinema no. 27, July-August 2003. Crowther quoted by Ford and Hammond, p. 145. Michel Ciment, “Jerzy Skolimowski”, Film Reference. Matilda Mroz is a British Academy Postdoctoral Fellow and the Charles and Katherine Darwin Research Fellow at the University of Cambridge from October 2009. She is currently writing on Polish cinema during the Socialist period.